The innovative design of this can opener makes safely opening cans a cinch! Is your wife tired of struggling with that outdated can opener that barely works, is clumsy to control, and leaves dangerous sharp edges? Then it’s time to check out this Smooth Edge Can Opener! A great idea for Christmas gifts for wives who love to cook, this innovatively designed opener features a single, easy-grip, no-slip handle that makes opening cans a breeze. 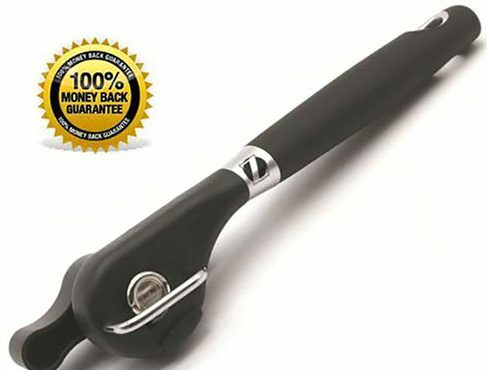 It’s the size of standard can openers, and is equipped with an easy turn ergonomic handle that’s perfect for almost any hand size. The modern design is actually quite stylish, and it’s sure to be an interesting but highly functional conversation starter with your dinner guests. Order one today as part of your collection of Christmas gifts for your wife and receive a FREE PDF copy of the full-length sci-fi novel Star Angel as your free gift. It features 457 pages of fascinating content, and it is even signed by the owner. Additionally, when you buy this Zulu Quality opener, 5% of your purchase goes to the Feeding America network so you can help ensure that hungry Americans have enough food.